The Wire Fox Terrier’s history is mostly unknown. By some theories, the Wire Fox Terrier and the Smooth Fox Terrier are variations of the same breed (they were interbred until the 1980’s); another theory is that the Wire Fox Terrier descends from the Rough Black and Tan Terrier of Wales and Derbyshire while the Smooth Fox Terrier descends from the Smooth Black and Tan Terrier, Beagle, and Bull Terrier. The Wire Fox Terrier was popular for fox bolting (chasing foxes out into the open where they could be attacked by larger dogs); a short, thick tail was preferred for pulling the dog out of foxholes by the tail. The Wire Fox Terrier was an early show dog which made its first appearance at the start of the 20th century, about 20 years after the Smooth Fox Terrier. Fox Terriers were recognized as one breed in 1885 by the American Kennel Club and accepted as two distinct breeds a century later. Though Queen Victoria owned a Wire Fox Terrier, it did not become a popular pet until one appeared in the hit detective film series ‘The Thin Man’. Other famous Wire Fox Terriers include Snowy from the European Comic ‘Adventures of Tintin’ and Charles Darwin’s Wire Fox Terrier Polly. The Wire Fox Terrier has a shoulder height of 33-41 cm (13-16 in) and weighs 7-8 kg (15-19 lbs). The Wire Fox Terrier has small, round, dark eyes and highly set ‘V’-shaped ears which fold forward. Wire Fox Terriers have muscular, well-proportioned bodies with a highly set, straight tail and small, round feet. The Wire Fox Terrier has a distinctive rough, broken coat. The coat is predominantly white with possible black and/or brown markings; saddles are common. The Wire Fox Terrier has a solid or half-and-half colored face with possible markings or blaze, or color on the eyes and/or ears only. The Wire Fox Terrier sheds little and is a good breed for those with allergies. The Wire Fox Terrier is very loyal and affectionate. It is playful, energetic and exuberant, with an abundance of courage. Wire Fox Terriers make excellent pets, but if ignored or unexercised they will bark, dig, chew furniture, and stage escape attempts. The Wire Fox Terrier is very loyal and affectionate. It is playful, energetic and exuberant, with an abundance of courage. Wire Fox Terriers make excellent pets, but if ignored or unexercised they will bark, dig, chew furniture, and stage escape attempts. The Wire Fox Terrier needs to be socialized well as a puppy. It tends to pick fights with other dogs. Wire Fox Terriers are reserved with strangers. They make good playmates for children, but should be supervised around young ones as they may tend to bite. Wire Fox Terriers occasionally like to bark and explore. You can find Wire Fox Terrier puppies priced from $700 USD to $2000 USD with one of our credible breeders. Browse through our breeder's listings and find your perfect puppy at the perfect price. The Wire Fox Terrier needs to be socialized well as a puppy. It tends to pick fights with other dogs. Wire Fox Terriers are reserved with strangers. They make good playmates for children, but should be supervised around young ones as they may tend to bite. Wire Fox Terriers occasionally like to bark and explore. The Wire Fox Terrier should be brushed several times a week and bathed when necessary. It should be groomed several times a year; show dogs are stripped rather than clipped as clipping lightens the color and makes the coat less rough over time. The Wire Fox Terrier has a lifespan of 12-15 years. It is prone to epilepsy, deafness, skin problems, and eye problems. The Wire Fox Terrier should be obedience trained as a puppy. It requires consistent training and may challenge authority on occasion. The Wire Fox Terrier requires daily exercise in the form of a long walk or play in a fenced-in yard. If unexercised, it may become disobedient. 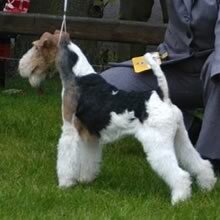 Wire Fox Terrier Puppies for Sale - Shipped Worldwide! Finding the right Wire Fox Terrier puppy can be dog gone hard work. PuppyFind® provides a convenient and efficient means of selecting and purchasing the perfect Wire Fox Terrier puppy (or Wire Fox Terrier puppies) from the comfort of your home, 24 hours a day, 7 days a week. Take advantage of our PuppySearch or leisurely browse our directory of hundreds of dog breeds, Wire Fox Terrier dog breeders, Wire Fox Terrier dogs for adoption, and Wire Fox Terrier puppy for sale listings with photos and detailed descriptions. Some Wire Fox Terrier puppies for sale may be shipped Worldwide and include crate and veterinarian checkup. Many Wire Fox Terrier dog breeders with puppies for sale also offer a health guarantee. With thousands of Wire Fox Terrier puppies for sale and hundreds of Wire Fox Terrier dog breeders, you're sure to find the perfect Wire Fox Terrier puppy.